The St. John singing group was born on Monday 24th February 2014, after Janet Mitchell was asked to start up a group in the village. 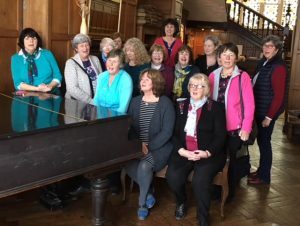 Eleven ladies attended that first session, with everyone insisting that they couldn’t sing; Janet now has about twenty regulars – and they can sing! It is definitely singing for fun, but sometimes the talking and laughing has to be brought under control! The sessions are on Monday mornings at the village hall from 10.00 to 12.00 am (with a break for coffee), it certainly sets one up for the week in good humour. There is a wide and varied song repertoire…… from Cornish folk songs, to Simon & Garfunkel, …..to the musicals, and many others in between. There are over a hundred songs on the list and anyone can suggest new ones – within reason, and within the capabilities of the accompanist! The group also has percussion instruments to accompany the keyboard and singing. “The voice is an instrument and without regular practice it will be lower than it was in our youth, so most pieces have to be lowered to suit our voices, as there will always be a chorus of ‘that is too high’”. The group started off with having the song sheets written on the back of wallpaper, and pinned onto a blackboard, but are now hi-tech, as the 50p subscriptions have bought us a wall mounted screen, and the words are now projected from Powerpoint onto to the screen. If you wish to join in and try out that rusty old voice of yours then please contact Janet Mitchell on 823230 and j.k.mitchell@sky.com.